After reading this book, I have to agree following your instincts sometimes is a good way to go. For instance, this may be a pretty naff example, as I was posting an A4-sized letter I wondered why they hadn’t made the post-box hole bigger for A4 letters. Hmmmm….. After squeezing it through the letter box I walked away feeling a little unsure. Turns out my mum had to pay a pound something to get my letter because of its size. I should have just folded the dam letter and taped it. Euh. I was even reading this book at the time of this horrible incident! 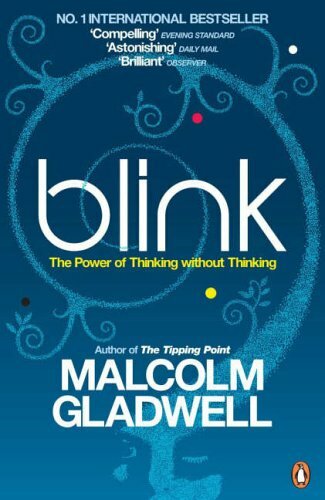 ‘Blink’ by Malcolm Gladwell is about snap judgements and gives numerous examples of when judgements go right and wrong through scientific research and stories. Thin-slicing was one of the chapters explaining how our unconscious minds can make pretty accurate assumptions in a very short period of time. There was a great research experiment in the chapter showing if couples were compatible through a casual chat. The couple were video-taped whilst having a conversation about buying a dog – a seemingly harmless subject. First impressions, the conversation seems playful in manner and typical. However, when the researchers analysed the tape carefully, they discovered something quite different. Their facial expressions, body language patterns, and gestures, revealed many deep-seated problems which most probably will interfere with their future relationship. Another chapter later in the book describes a firefighter’s experience on making a critical snap decision which not only saved his life but the lives of others too. The fire was in a kitchen in the back of a one-story house in a residential neighbourhood, Cleveland. Firefighters broke down the door and made an attempt to douse the fire with water. However, the water did not seem to dissipate. The fire lieutenant remembers, he suddenly thought to himself, “There’s something wrong here”, and he immediately commanded his men out. Moments later, the floor they were standing on collapsed. It appeared that the fire was in the basement, not in the kitchen. The lieutenant cannot explain how he know to get out, it just “blinked” and, thus, made the right decision. Overall, the book was a very interesting read. Relating to my discipline, when making decisions I will most likely go with my gut feeling. When talking to customers or clients I will try and read their body gestures in order to see if they are comfortable with my designs or ideas.